Arriving in limited theaters this week is one of our favorite films from the Sundance Film Festival this year, a coming-of-age comedy called The Kings of Summer, formerly known as Toy's House (watch the trailer here). CBS Films picked up the indie for release at Sundance and starts releasing it in theaters today, with expansions the next few weeks. It's great, a hilarious but heartfelt film. Director Jordan Vogt-Roberts hired a few designers to create artistic posters for the film, starring Nick Robinson, Gabriel Basso & Moises Arias, and has released two so far. They are Mondo-esque posters worth viewing even if you haven't seen it. 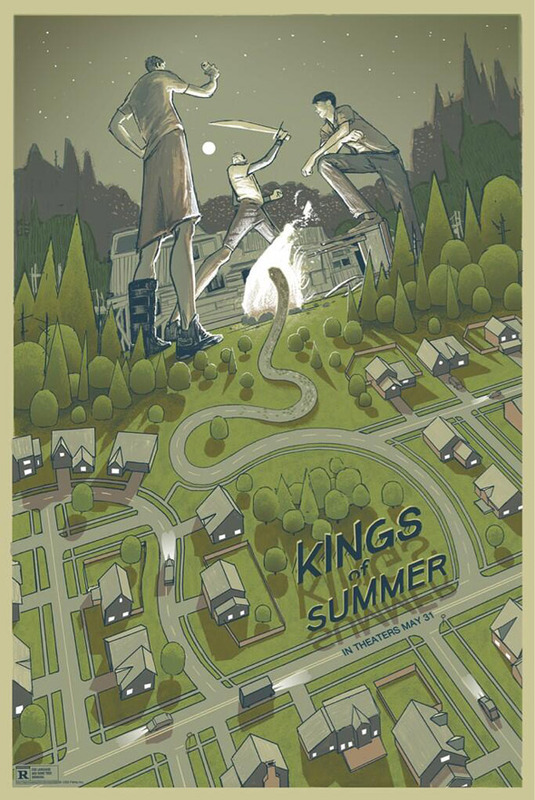 "One of many limited edition posters I had made for The Kings of Summer. Rich Kelly killed it with this…"
Love the top one. The bottom one reminds me of 1980's videos, verging on The Goonies, I think the black background is putting me off though.